The radical transformation in Western culture in the Sixties still shapes the contemporary. The looks, the sounds, the sense of liberation were so far-out, so transcendental, that it can still blow our minds. 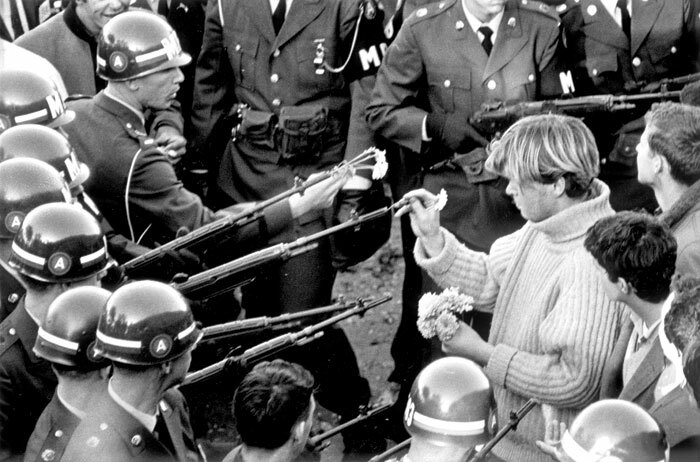 At the time, it may have felt profound to declare rejection of everything square and put a flower in your hair, but movements like that against the Vietnam War were deadly serious. Seeing the Earth for the first time as a cloud-streaked blue ball in space literally changed our world view. So it’s a fabulous subject for the V&A to explore, and the primary thread to lead us through the epic exhibition is music, heard over Sennheiser headphones that sync with the zone you’re in. The book can’t compete with the immersiveness of the show, but it brilliantly drills into the detail. The ‘trip’ starts in the corridor at the show’s entrance. LP sleeves from the record collection of taste-meister DJ John Peel line the wall (and continue inside), and a quote from a Lennon lyric: ‘Turn off your mind and float downstream’. 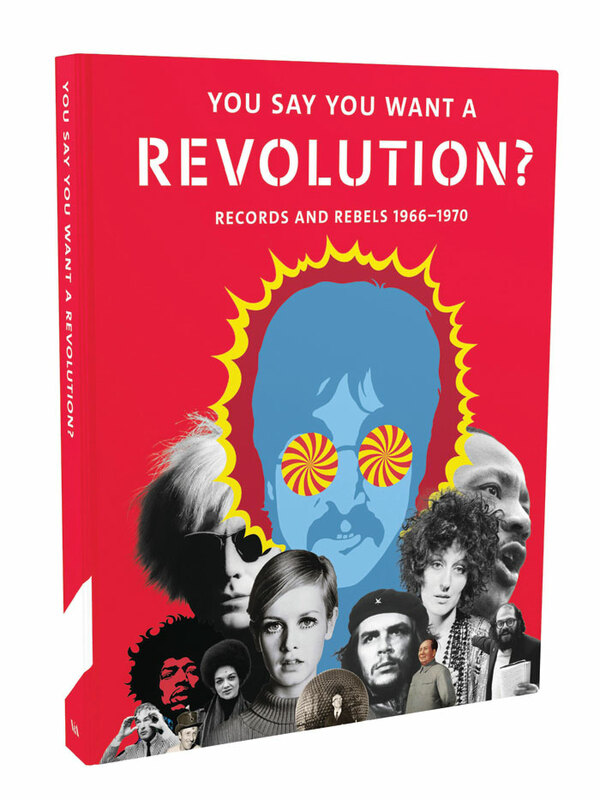 The show’s title is from Revolution, another Lennon song that the Beatles actually released in two versions, in one of which he sings ‘you can count me in, out, in, out’. That highlights an ambiguity in the culture for those who’d been parading their grooviness in 1966 or blissfully tripping through 1967’s Summer of Love. The next year, the reality of the world with its injustices and wars was mobilising mass protest — were you in or out? That pivot, between the media -amplified style revolution in essentially a narrow part of society and rejecting the whole political status quo, emerges as you move through the exhibition. The politics was always simmering. In 1963, Britain indulged itself in a state of shock, learning that War Secretary John Profumo had dallied with model Christine Keeler, who also kept company with a Soviet naval attaché, Yevgeny Ivanov. Lewis Morley’s iconic photographs of her naked on an Arne Jacobsen 3107 chair (actually designed eight years earlier) are on show. They are monochrome, but the sombre tones of post-war Britain were about to be blown away by the rise of colourful Swinging London in 1966, the start of the period the V&A show concentrates on. It gives space to Twiggy with her fresh-faced androgyny, and simulates a Vidal Sassoon salon where his wash-and-wear bobs, liberating women from curlers and fussing, were crafted. 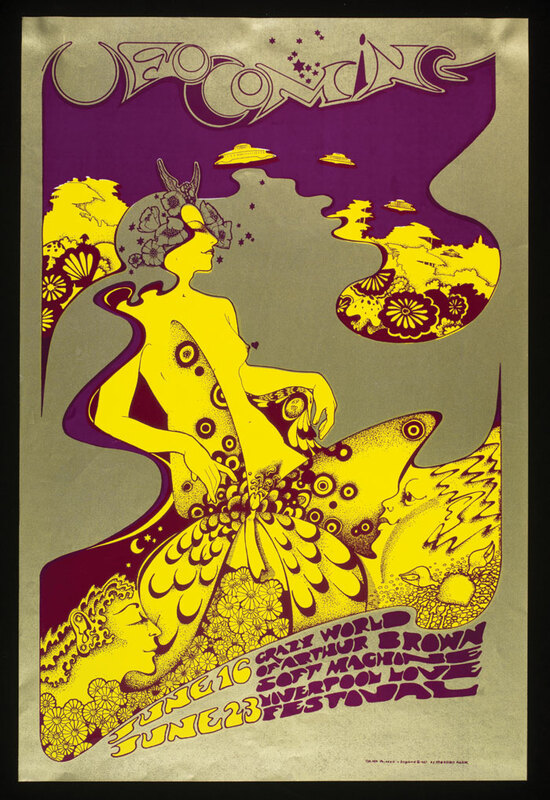 Mind-expanding LSD gave rise to psychedelia, which in graphic design was never better represented than by the posters of Hapshash (Nigel Waymouth and Michael English), for gigs at legendary London clubs such as UFO. Art, too, was metamorphosing. Conceptual and pop art, mainly from the USA, were making the abstract expressionism of the Fifties look like old hat. Yoko Ono’s Ceiling Painting was shown at London’s Indica Gallery in 1966, a ladder leading to a magnifying glass through which you could read the word YES. The V&A reproduces the work, which had first switched Lennon on to her. By 1968 things take a gritty turn. Entering a room called Voices of Dissent, Martin Luther King says, ‘I have a dream…’ through your headphones, followed by the Stones’ Street Fighting Man. In 1960, the USA had 900 troops in Vietnam — in 1968, there were 536,000. We see its anti-war demonstrations, and are reminded of the four students shot dead by the National Guard at Kent State in 1970 (Crosby Stills Nash & Young’s vinyl 45 about it, Ohio, is on show). Where previously mannequins had displayed groovy clothes like a stripy Mr Fish suit or a dress worn by Sandie Shaw, we now see uniforms of France’s CRS (the militia deployed against the Paris 1968 protests), the National Guard, the US Army, Black Panthers (cool leather jackets, beret and rifle)… and Barbarella. Feminism occupies a wall including clarion-call books by Germaine Greer, Betty Friedan and Kate Millet. Gay liberation curiously includes a vitrine with a Dusty Springfield dress. Such causes are now foundation stones of liberal societies, but they were militantly counter-establishment then. And struggles went beyond the English-speaking world. The odd one out is the Mao-backed Cultural Revolution in China, occupying 3m of wall display — it ushered in a dark eclipse of freedom rather than liberation. What about product design? The next room is full of it; including Boeing’s 747 (no, not the whole thing), Campbell Soup’s paper Souper Dress (a take on Warhol’s appropriation of its product) and Oliver Morgue’s Djinn Easy Chair (which Kubrick placed in the 1968 film 2001: A Space Odyssey). The choices are sharp, but just glimpses into a whole new world designers were shaping. As for architecture, there’s almost nothing except Buckminster Fuller and images of Montréal’s Expo 67 — his Biosphere dome, and (a pleasant surprise) Basil Spence’s brutalist UK Pavilion, with its 3D Union Jack on a 60m tower. Yet the Sixties was a decade of architectural, conceptual, counter-insurgency, and we see no Archigram or Superstudio, no Cedric Price or Yona Friedman. 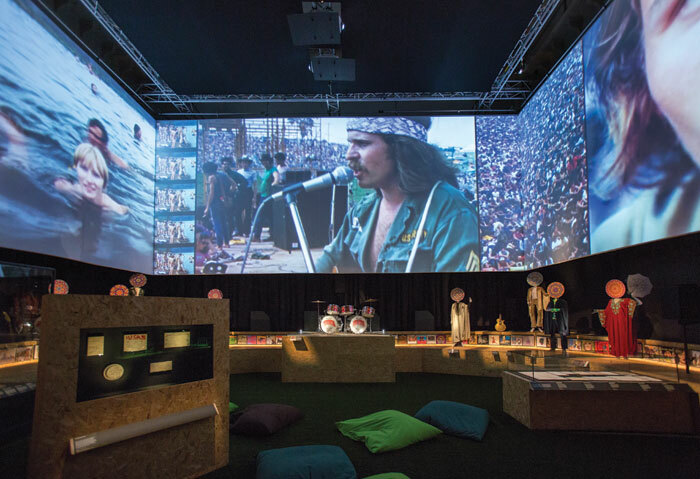 Perhaps the Sixties’ crescendo was the vast hippy-fest of music at Woodstock in 1969. Film from it is projected on screens in the largest room, with beanbags on the floor. It’s just beyond the space suit of Apollo 8 astronaut William Anders, with that view of Earth from lunar orbit, which he took. An environmental movement had begun to see that everyone occupies this precious, delicate spaceship, and we were trashing it. The penultimate room gives space to off-grid West Coast communes and Stewart Brand’s Whole Earth Catalog, as well as Hewlett Packard’s chunky HP9100A (1968), a precursor of the personal computer. Finally, we see the brown velvet jacket Lennon wore in the Imagine video (1971), and are left with his gentle, idealistic dream of a world the previous decade had suggested. The accompanying 320-page book, edited by the exhibition’s curators, has essays (including Jon Savage on drugs) that delve deeper. San Francisco’s role in music, underplayed in the show, is rightfully restored in Howard Kramer’s text. The writing and cornucopia of images are simply outstanding — and thankfully it has an index. Is So You Want A Revolution a history lesson or just a massive nostalgia binge, an exercise in retro-FOMO (fear of missing out, but for something long gone) like the restored Hendrix flat in Mayfair? Clearly, the exhibition is both. The Sixties was the best party you could ever go to, but it was also an awakening, shaking the existing social order, and it established a new narrative about how we should all live together. At a time when loveless Brexiteers and Trumpistas want to close off and preserve their little worlds, that’s exactly what we need to be reminded of.